So Ford announced that they'll be adding some buttons to MyFord Touch soon. That can't come soon enough. Here's why. Early last year, an alarming proportion of my friends all treated themselves to new iPhones, within days of each other. While the existence of a minor conspiracy is debatable, what’s certain is that they all experienced the ‘new gadget high’ very recently. Flying high above Silicon Valley, beaming new owners surgically extract the ‘newborn’ out of its packaging – lest they give it any unwarranted scratches – watching the reflection of their ear-to-ear grin wash away in the appearing image of the touch-sensitive home menu. The following hours wash away in a similar fashion, as software is explored, music libraries are uploaded, synchronizations are done, and more software is installed. 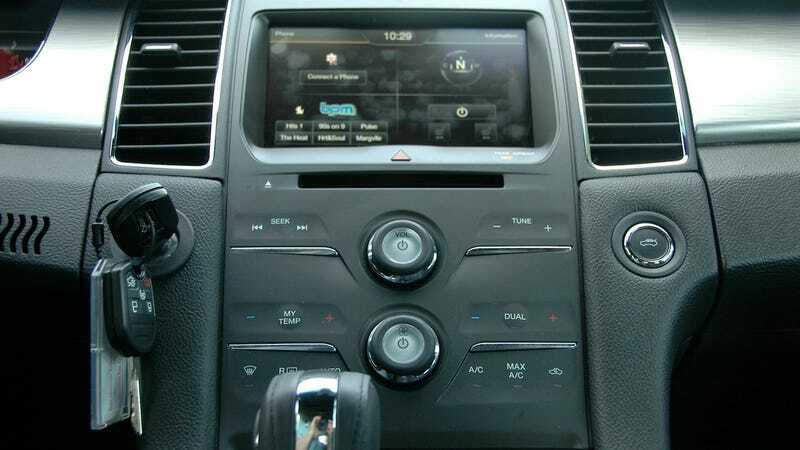 Driving away in a Ford with MyFord Touch is not unlike any of this, since MFT is the iPhone of its market. You get an 8-inch touchscreen, two 4-inch screens on either side of the (analog) speedometer, and two sets of corresponding analog buttons on the steering wheel. Via this interface, you can control every single aspect of the car like it's a smartphone. Except there isn’t one: the temperature is controlled in much the same way that you used to seek through radio stations or CD tracks – with “plus” and “minus” haptic hotspots. By the time you’ve combed through all the markings on the touch panel, you will have twice rear-ended the car in front of you. Buttons and knobs have a particular (and effectively standardized) shape that your fingers know to look for without any input from your eyes. This lets you increase the temperature without crashing. In other words, anything touch-sensitive has an inherent problem: in order to operate it, you have to look at it. And that’s not so good when you also have to look at the road at the same time. Oddly, F-150's with MFT have regular buttons instead of this touchy-feely business. Why only give pickups controls that you can actually use while simultaneously looking at the road? Fusion drivers wear gloves, too! Well, that is what the sales literature says… The fact of the matter, though, is that all of the center stack functions are squished into the right screen, and the vehicle stats are confined to the left one. Imagine that, on a cold morning, you adjust the ambient temperature to your liking with the steering wheel controls before you set off. Some distance down the road, you want to listen to the radio – but the appropriate screen is still in the climate menu. In order to listen to the radio, you have to exit the climate menu, enter the entertainment menu, select radio, and seek to your desired station – all the while experiencing the necessity of looking at a screen and not at the road instead of pressing one simple button. Nope. There are screen functions that can only be enjoyed while the car is moving, like the function that displays exactly what the all-wheel drive system is doing to each wheel at any given moment. Try telling that to the police officer who pulls you over for almost running him off the road. On the other hand, MFT is immensely capable. Bluetooth hands-free operation is seamless, even if you have an old phone. MP3 players are completely integrated: they can be browsed via the head unit just as easily as through their own interfaces. It can play your media via USB, auxiliary input, SD cards, component cables, Bluetooth streaming, and CD’s, in addition to AM, FM, and satellite radio. It even has Internet. Its crowning jewel, though, is the voice command system. I vastly preferred using its voice controls than any tactile input – it’s that good. You don’t even have to say “Sirius” first, but simply “Watercolors” or “BPM” and it’ll tune itself. Regardless, it’s still not driving-friendly. Questioning yourself whether you’ve set the temperature correctly while going down the highway is not an experience to look forward to... I bet we'll still be doing that after the "volume and tuning knobs" are added. Well, except if you drive an F-150.